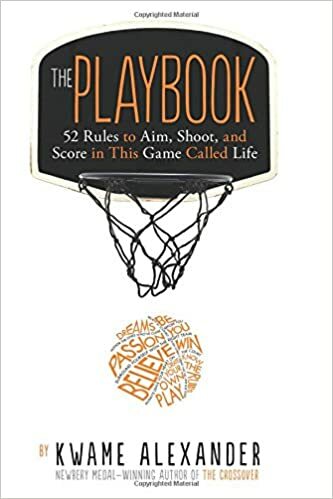 Summary: Kwame Alexander begins this book with his own athletic journey from basketball to football to tennis, where he finally found the sport that made him a high school champion. After this introduction, the book is divided into four quarters, like a game, entitled Grit, Motivation, Focus, and Teamwork. Each section begins with a profile of an athlete who personifies that trait, then there are 13 rules, each one accompanied by a drawing or photo of an athlete, and an inspirational quote. Alexander refers to the rules as “poems”, but that feels like a bit of a stretch. The quotes are mostly from athletes, but a few other celebrities like Oprah Winfrey and Michelle Obama are included. 176 pages; grades 5-8. Pros: Anyone looking for a little inspiration will find plenty of it in these pages. Young athletes will particularly enjoy the sports stories and quotes. 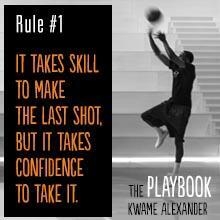 The sharp black, orange, and gray graphics are similar to the covers of Alexander’s books “The Crossover” and “Booked”. Cons: This feels more like a graduation gift or self-help seminar than an actual reading experience.